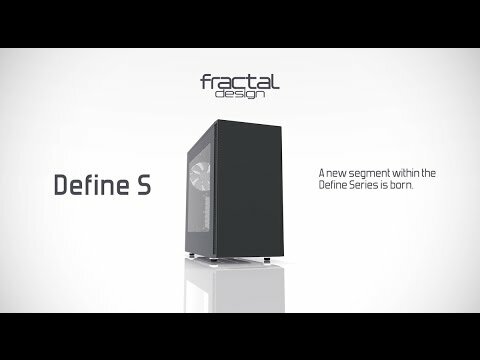 Fractal Design Define S Window Edition Black Mid Tower ATX/mATX/mini-ITX Computer Chassis with USB 3.0 + Silent Design is rated 4.8 out of 5 by 10. Rated 4 out of 5 by Limecat from Very neat, lots of space, great quality Coming from a Fractal Define R3 the exterior is pretty similar but upon first glance the Define S is a wider by about an inch but still fits snug under my deskdraw, the cable management and having the storage drives mounted on the back hidden wall is really nice although if you plan to use more than 3 hdd's and more than 2 ssd's then you might want to look at more conventional cases with the nasty looking huge drive bay towers in them. I have a 360mm cpu water cooler on the roof and mounted the two included 240mm fractal fans on the front and my gpu water cooled hydbrid has the 120mm rad fan mounted on the back wall, it all fits neatly and plan in the future to convert to a fully custom water loop as this case has plenty of room for it when the current 1080ti can no longer run future games at the settings desired. The case loses a star on quality because the acrylic window is a disappointment and arrived already with some large scratches on the edges straight out the box where the protective packaging film does not even cover all the way to the edges and looks as though this plastic will be very very easy to scratch. Other than that rest of the quality is fantastic and building in it was a pleasure otherwise. Rated 5 out of 5 by PCFlyer from Excellent Case I really like this case as it is well thought out and the build quality is great. It is not that tall so it fits neatly under my desk draw out of the way. The provision for the SSD's/HDD's is very neat but if you use more than 3 HDDs this case is not for you. Rated 5 out of 5 by frankyj from very easy to build in! this case is fantastic. my old case, the NZXT H230, was fine but what I didn't like about it was how little room there was for cable management and poor quality materials/screws. getting the side panel on behind the motherboard was a nightmare and the screws would easily strip the threading on the case. for example, one of my fan screws i had to rip out in order to remove the fan and the screws to hold the GPU in would keep spinning so the GPU wasn't being held properly. with this case, the Define S, these aren't issues. there is loads of room between the motherboard/side panel for cable management. also this case has velcro straps to hold cables in place. it does come with cable ties but i only used 1 or 2. the material of the case feels much stronger and no screws were stripped. everything feels like it's held in place real firmly. another thing i like about this case is that it has no 5.25 or hdd bays. well, it does have HDD mounting brackets hidden behind the motherboard which gives the case much better airflow. the fans that come with it pretty much silent and you can have a total of 7 fans! there is plenty of room too if you want to use liquid cooling be it an AIO radiator or custom loop. i have nothing bad to say about this case. Rated 5 out of 5 by Shotokanads from Great Value for Water Cooling Hi, Initially I was worried that the Define S would be too small for my pending water cooling build which was planned to include a PETG loop, seperate reservoir, D5 pump and two Hardware Labs radiators with fans. I was wrong, Everything fitted in without it looking too cramped. Having finished the build I do think you should be aware of a few small points if you plan a similar setup. The fixing thumb screws for both side panels are not brilliant, they work, however, it would have been better if they were bigger and stronger. It's probably me being a bit picky but I am even considering removing the screws and re-threading the holes to a larger size. Radiator thickness is something you need to consider in your planning. I put a 360mm in the roof and a 240mm in the front, both being 35mm thick so add 25mm for fans and your there. You could use 45mm thick rads but in my opinion that was too close to components, especially if you have RAM with high heatsinks. The other issue with the rads is the hole positions in the roof. With the 360mm the fittings were on the left side above the GPU block. When you attach the fittings it is too close to the rear fan for both to be present, therefore I had to remove the rear fan to get the rad and fittings in. Finally, I had to do some small modding to get the reservoir mounted where I want it. The case has a simple mounting method, however, the location did not match up with where I needed it to be so a few extra holes were added to accommodate. I would not normally use a mid-tower case for a water cooling build, however, case size was a main issue as I wanted to keep it smaller than normal. Great case (with the above points in mind) and a sensible price. Nice one Fractal! Rated 4 out of 5 by William7867 from Great Case Great case with good solid cable management, plenty of space in the back for your cable mess and the Velcro tie-downs help a bunch. Included fans are good enough. Side window is the only downfall, the quality of the acrylic seems pretty poor and can scratch really easy, even just wiping a bit of dust of with a soft cloth. Rated 5 out of 5 by Bleakwinter from Great case Lovely case very simple to install into, very clean look inside thanks to the hidden storage. Rated 5 out of 5 by C6patchman1 from Excellent product, Lives up to all expectations. Excellent product, Lives up to all expectations. Loads of room for watercooling. Rated 5 out of 5 by JoeGamer from Perfect for water cooling, great quality This is a great case, the paint job is very good, the plastic front panel doesn't look out of place and just looks like brushed aluminium. Managed to fit a 360mm long 8cm thick monsta rad in the front with fans on the outside of the front, behind the plastic panel and a set on the inside, push pull. With an EK res also mounted on the metal slits. (Mounting hardware included). I used the included res mounting hardware vertically. Lot of room behind the mobo tray, with velco straps. The window is nice and clear with no tint, it is screwed in. Can an EK 360mm radiator be mounted in the front of this? It seems like while there is 360mm of space at the front of this there is the possibility that the additional length, because of the in and out ports on the radiator, will make it too large to fit at the front.